← Photos from the first week of May. “Like a good neighbor…” tonight it wasn’t State Farm, but my garden that was there. I had planned to make a salad using leftovers, including a giant bag of pre-washed, pre-cut kale. I’ve resorted to these resource-guzzling bags of greens trucked in from who-knows-where in an effort to keep up our healthy greens intake during the off-season. I’m so glad THAT is coming to an end. And hopeful I won’t resort to this next year. As I poured the kale into the salad bowl I discovered that much of it was rotten and moldy. Ugh! Such a waste. And worse–it was the main feature of my dinner for the night. Realizing there was nothing to salvage in that bag, I took the whole thing out to the compost and tossed it in. While out there I glanced over to some lettuce I had put in on a whim last month. It looked good! I pulled it out. Then, I went in the house for a few supplies and came back out to find other things for the salad. I ended up with a delicious combination of romaine lettuce, baby kale (2 kinds), arugula, chives, radishes and pea tendrils. This mix was so far superior in flavor and freshness to that sad bag of kale that I immediately realized (once again) how amazing a garden can be. This was actual green food. Not some trucked-in greenish food that was picked three weeks ago and put in plastic. Because I had a garden, my family ate better tonight than if I had not had one. Because I had a garden, I did not have to leave my house to go to a store and purchase a new bag of kale. 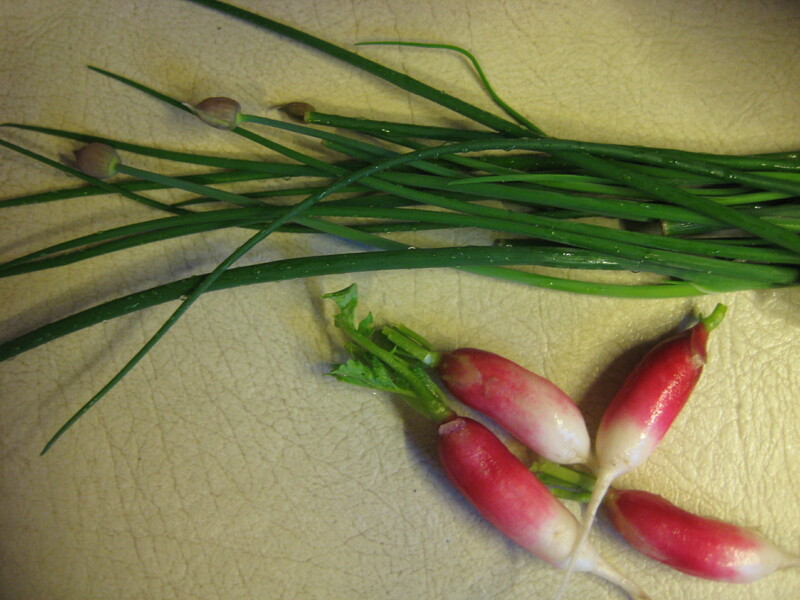 Because I had a garden, I stopped for an extra moment–outdoors, in the rain no less–and thanked God for the food he was providing. I’m so thankful to have a garden. Now, take a look at tonight’s dinner! The beautiful blend of greens! 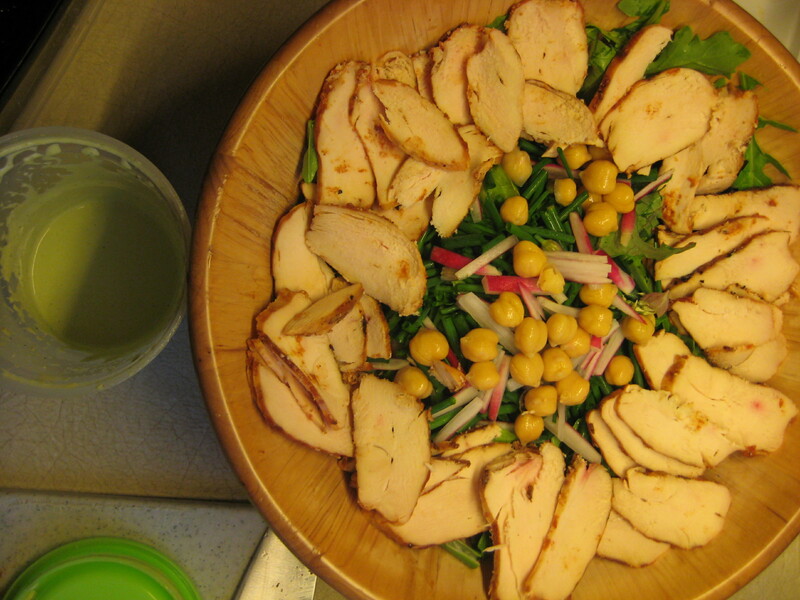 Salad with chicken, chickpeas, chives and radishes added. To the side you can see the homemade ranch dressing. You didn’t think I’d forget dessert did you? I went out in the light drizzle of rain today and happily harvested some rhubarb to make the pie my six year-old had requested. 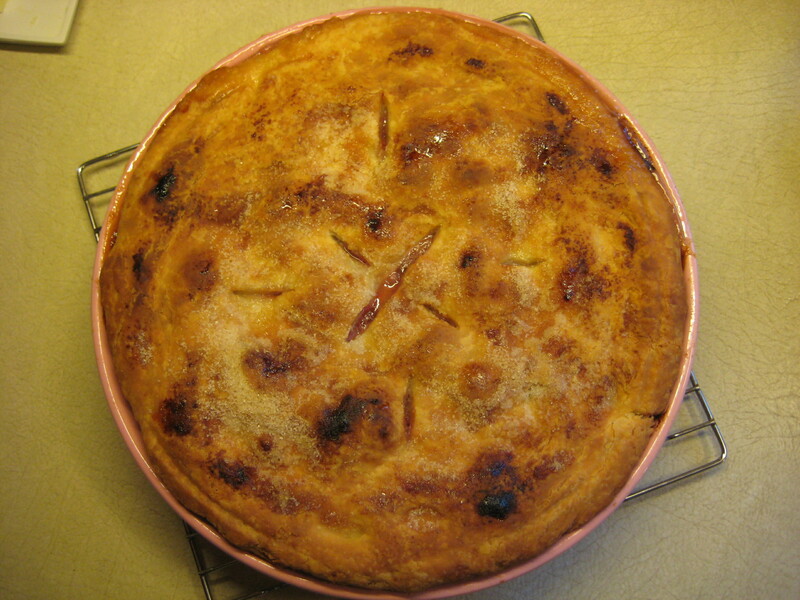 Rhubarb pie, a perfect sweet-tart end to my garden inspired meal. There were a few things I wanted to share regarding tonight’s meal. The first, is that my kids wanted to play a game in which I told them to look for a certain thing and they would find it and eat it. So I would say, “Find the arugula!” and they would find one and excitedly hold it up to show me. They got the idea to do this because I told them there were seven things from the garden in the salad, they wanted to find each one. For once they were happy that I let them “play” with their food. Second, the ranch dressing we had tonight was leftover from my son’s first birthday party this past weekend. It went over BIG TIME with the crowd, so I thought I’d share a link to the recipe with readers in case you were looking for something new to try. There’s even a video of her making the dressing. Check it out! And finally, I just want to encourage anyone who may be reading this to try planting a little something. 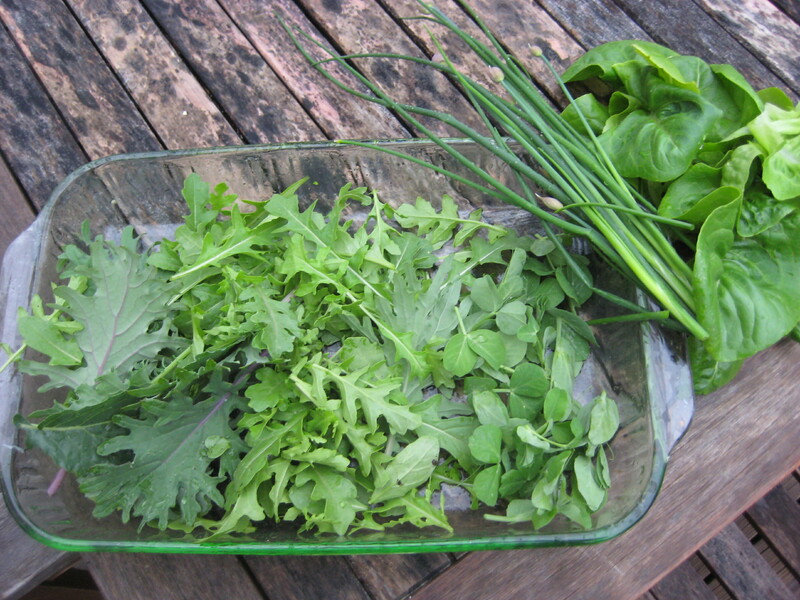 You don’t need to have seven things available to go in a salad in order to grow your own food. One thing in a pot is good too! In this day and age when we don’t know who grew our food or where it was grown, there truly is insurance in knowing that you grew something–anything. It’s good practice to plant something if you can. So, give it a try this season. And may God bless your garden! 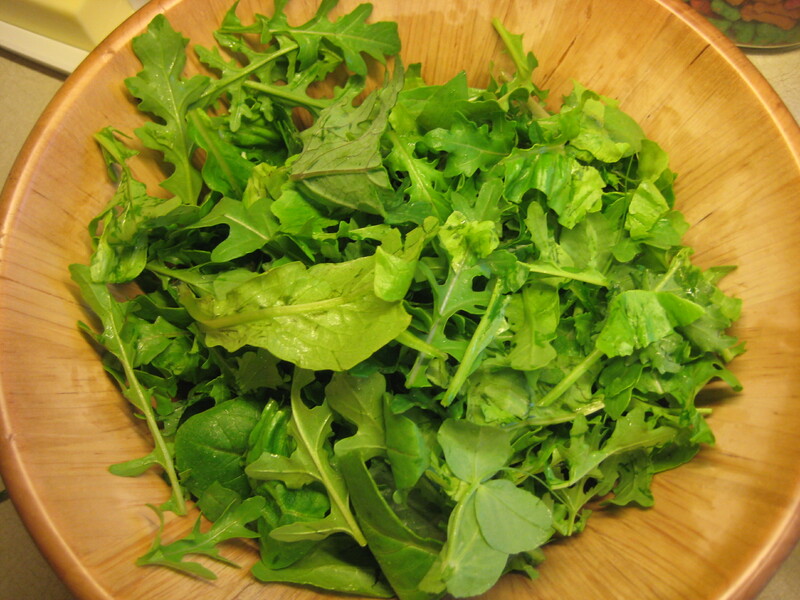 This entry was posted in Garden to Table and tagged arugula, kale, lacinto kale, lettuce, pea shoots, pea tendrils, radishes, ranch dressing, red russian kale, salad, spring greens. Bookmark the permalink. Great post! loved it all…good work mama. Sending Love and Best Wishes! Ang ~ well how about that ha? luck with your garden this year. Aunt Judy, I wonder what you will plant? Your flowers are always beautiful.